The Granite Gurus: FAQ: How much does granite weigh? FAQ: How much does granite weigh? My first job in the stone industry was working in the showroom at Arizona Tile. I think the most frequently asked question that I received while working there was "How much does granite weigh?" It really depends on the color of granite & the thickness. The quick answer is approx. 12-20 lbs per square foot. 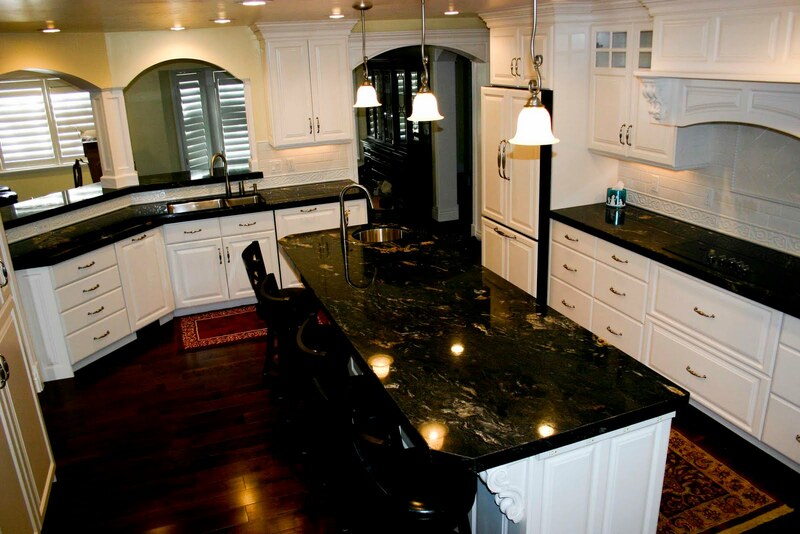 The darker stones tend to be more dense & subsequently weigh more than lighter colored granite. Obviously 3 cm slabs will weigh more than 2 cm slabs. So the average slab weight is usually between 700-1200 lbs. Will your cabinets be able to support the weight of the granite? Yes, in almost all cases. Granite distributes it's weight across the cabinets. When we template we will let you know if we feel like your cabinets need to be reinforced. I've only had one client need to reinforce their cabinets for the granite, so it's pretty rare. That's a pretty kitchen pictured here.